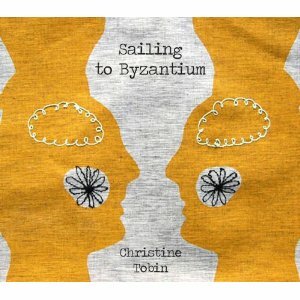 The rich source material for Christine Tobin’s latest album positively encourages metaphor, so here goes. Sailing to Byzantium is a vibrant, irresistible lake. There’s nothing to be gained from standing suspiciously on its shore. Take a deep breath, plunge in, and let the water draw you down into a musical world of burnished colours, intriguing shades, spine-chilling dangers and soothing sub-aquatic glades. Tobin’s audacity in setting 13 of W. B. Yeats’s poems to fluid and spacious jazz arrangements pays off on every level. The poet’s characteristic themes of memory, time and place, unattainable love, the artist’s lot, and mythology shine through, heightened but never unnecessarily embellished by some brilliant ensemble playing. Tobin isn’t the first composer to set Yeats to music. Herbert Hughes, for example, wrote a rollicking tune for “Down by the Sally Gardens”, most recently recorded by Clare Teal for her album, Hey Ho. But Sailing to Byzantium is on a much more ambitious scale. And how Tobin pulls it off. It would be invidious to single out any band member; plaudits to Liam Noble (piano), Phil Robson (guitar), Gareth Lockrane (flute), Kate Shortt (cello) and Dave Whitford (double bass). With their support, Tobin’s warm timbre wraps itself around the shimmering imagery of Yeats’s verse, taking it into a new and very different space while staying true to the original work. Like Tobin, I studied Yeats at school, and was so absorbed by the texture and subjects of his poetry that I later seized the opportunity to immerse myself in it at university. Analytical overload was inevitable and it’s been many years since I revisited the glories of poems such as “Long-legged Fly” and “The Wild Swans at Coole”. Tobin’s inspired handling of the material has sent me scurrying to the bookshelf and reaching out for a familiar, yellowing volume as if it was an old friend. From the sparkling Joni Mitchell-ish guitar intro to the opening track, “When You are Old” to the elegiac tones of actor Gabriel Byrne (who taught at Tobin at school in Dublin) reading “The White Birds” to the backdrop of rising waves and Tobin’s wordless, keening chant, Sailing to Byzantium commands attention. The production is fresh and crisp. There is turbulent beauty, not least in the cacophonous climax to “The Second Coming”. Characters spring to life, greatly assisted by the sparkling arrangements. “The Song of Wondering Aengus” and “The Fisherman” – that paean to a simple, idealised reader – bristle with energy. Some of the songs are haunted and haunting in equal measure: ghosts gather and whisper as “In Memory of Eva Gore-Booth and Constance Markievicz” conjures a room populated by lost friends, to exquisitely poignant effect, building to the sinister revelation of knowledge that’s come too late. An artistic triumph, brimming with integrity.